This has been a week filled with sadness and tears, and I am finding that time in my kitchen has been soothing and a bit therapeutic. To focus on creating something with my hands is restorative and quiets my mind. Cooking and baking also allows me to share with others, to nurture and express care in a tangible way. We could all use a little extra tenderness right now. Cookies are, of course, delectable to give and receive. Sometimes, though, a not-so-sweet option helps to balance out the indulgent baked treats. Nuts are my go-to savory snack. 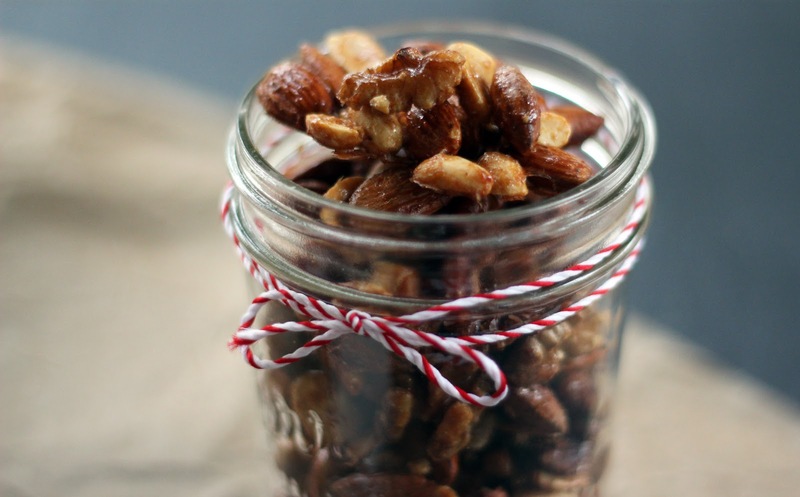 A handful of roasted almonds will often get me through the afternoon until dinner. Adding some spice and glaze makes them even more appealing (and harder to stop at a handful). While preparing for the Thanksgiving holiday, I began tossing some ideas for nuts around and have arrived at a recipe I really like. I began with maple syrup (oh, how I love maple syrup, it is so comforting). I mixed some syrup with ground ginger, cayenne pepper, freshly ground black pepper and flaky sea salt. 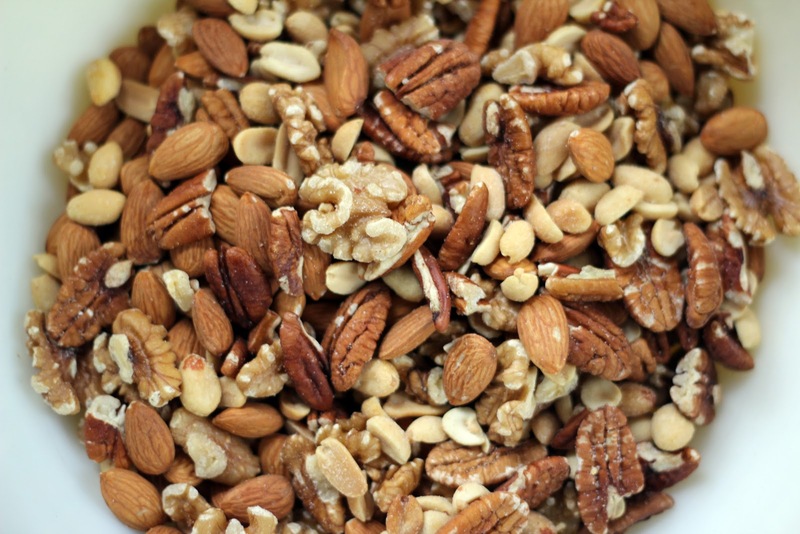 I chose a mix of almonds, peanuts, pecans and walnuts but you can use any variety of nuts you prefer. I poured the nuts into the syrup, stirred to coat them well and spread them on a baking sheet to roast in the oven. The house filled with the warm, heavenly scents of toasty nuts, maple and ginger. The nuts emerged from the oven a glossy, rich brown and, after cooling a bit, were soon being nibbled on - crunchy, with a spicy kick and a hint of sweetness. Fill a jar or little bag with some nuts and tie a ribbon around it. They are a lovely “I’m thinking of you” to share with someone as a thoughtful gesture or holiday gift. Small acts of kindness bring us together. Combine the nuts in a large mixing bowl. In a glass measuring cup, stir together the maple syrup and remaining ingredients. Pour it over the nuts. Using a couple of spoons (or your hands) gently toss the nuts to coat them evenly. Pour the nuts out onto the prepared baking sheet (scrape the bowl to get all the sticky deliciousness) and spread in a single layer. 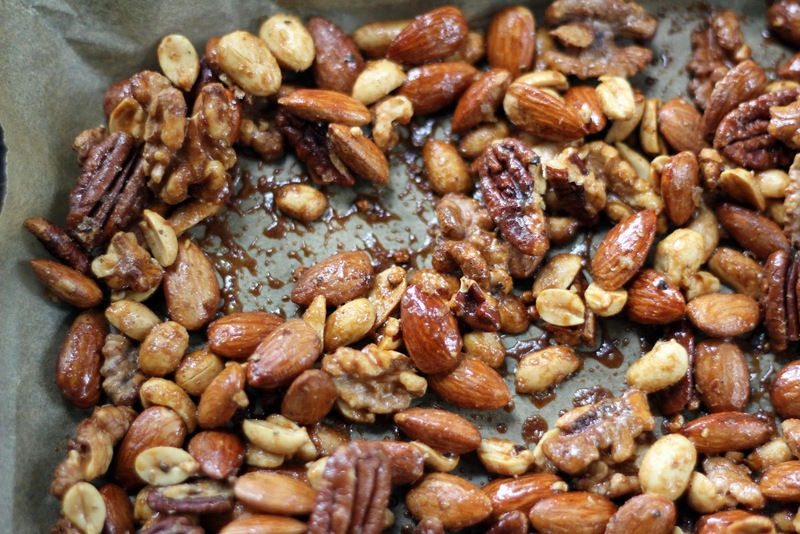 Bake for 15 minutes, stir the nuts on the baking sheet around a bit, and bake for another 10 minutes. The nuts should be a deep golden brown and caramelized. Remove from the oven and let cool. Store the nuts in an airtight container at room temperature. Those nuts sound like a perfect gift, I really love the spice combo! Thank you, Alyssa! The spices provide some nice warm flavor and keep the nuts from being overly sweet. Now I'm thinking about the next batch - maybe some Indian curry spices? Hope you're staying dry in this rain today...sad to see the little bit of snow melt away. More soon, I hope! Beautiful! Love the idea of serving them in jars. And how right you are that this was a week for healing and comfort and love; and no better way to share that than from your kitchen to anothers. Happy Holidays! Thank you, Erina! 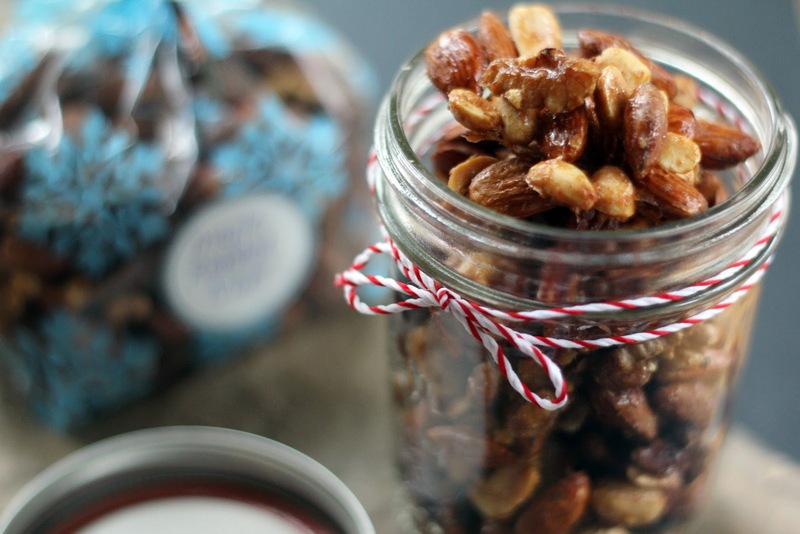 I just saw your mixed nut recipe and look forward to trying it next - sounds delicious. I hope you're enjoying your visit in Boston! We can definitely find comfort in the kitchen - I've spending lots of time there. 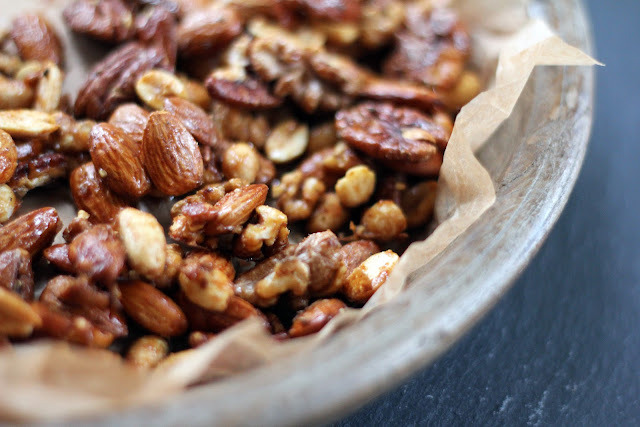 Mixed nuts are a great snack to have on hand and quick to make - hope you enjoy them! Wishing you a wonderful holiday season! I saw this this morning and made them this afternoon, I needed one more item to include in holiday gift boxes for the girls teachers. I love these nuts, a little sweet and spicy and so flavorful, Thank you for posting this it solved my gift box dilemma!! I used almonds, pecans, walnuts and hazelnuts, So yummy! Thank you for letting me know, Suzanne! I'm delighted you like the nuts and I love that you made them for teacher gifts. Hazelnuts sound like a terrific addition! Merry Christmas! Aw, I wish I'd thought of these for my gluten free people! As it is, I gave them all a jar of your cranberry sauce! Oh, Brooke, this makes me so happy! Thanks for letting me know. Merry Christmas! So sweet, and so true! We do all need a little extra tenderness right now. Wishing you a peaceful Christmas, Christina - I hope you get lots of time to relax and enjoy the season with family and friends. I too have been filled with sadness this past week. My heart is still grieving. Wishing you and your family a happy holiday season and a post Happy Hanukkah! Thank you, Karista! I hope you have a joyful Christmas with your family and enjoy lots of time together. A lovely and thoughtful gift that would bring a smile to anyone's face. Thank you, Karen! Wishing you a wonderful Christmas, and a happy, healthy (and delicious) 2013! They do disappear, Nami! It's quick to make another batch to snack on, though (which may be good or bad...). Oh these are soooo good! A little sweet, a little heat & a little salty....my kind of perfect snack. Thank you, my kind of snack, too, Mairi. I love getting all these different flavors from one treat. These are the perfect treat! As soon as they're finished I'm ready to make another batch. Definitely a keeper! I'm delighted you are enjoying the nuts! Thank you for letting me know. I'm happy you stopped by!